did you transition and for how long? did you BC? did you like it? I did big chop. Honestly I had hated it at first. I was so used to long hair all my life then all of a sudden I was bald. It was weird but I got used to. I have always hated getting perms. My mom would force me to get it and I would kick and scream because it burned. 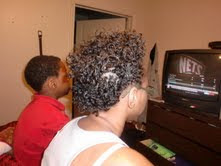 Perms was never my thing so when my sister went natural I saw how nice and curly her hair was. So I figured going natural I had nothing to lose. what was your family and friends reactions? 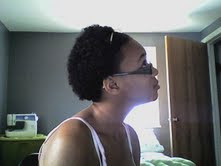 The day I big chopped my mom went crazy! She hated it. She screamed, she cursed, she had took my things away. It was a horrible day for me. When I had put my BC on Facebook, some people had loved it others were like "you were blessed with long hair that most black girls don't have, why would you cut your hair?" It was mixed reactions from everyone I knew but luckily my sister was supportive. Right now I want to grow at least an inch of hair by the time I start school again, which is in August. what products do you use and what are you learning about your hair? I have cradle crap (scaly and crusty skin rash that is on the scalp of babies and continues throughout life.) so I use medicated shampoo but I also use Giovanni leave in conditioner and mousse. I learned that my left side of my hair doesn't curl like my right side. I also learned that in order to keep the cradle crap out of my hair I have to wash it once a week or more. The advice I would give to other women or girls thinking about going natural is to make sure you have self confidence. With out it will be hard to continue the journey of natural hair. Also don't think about what others say, be sure in yourself that its what you want to do. 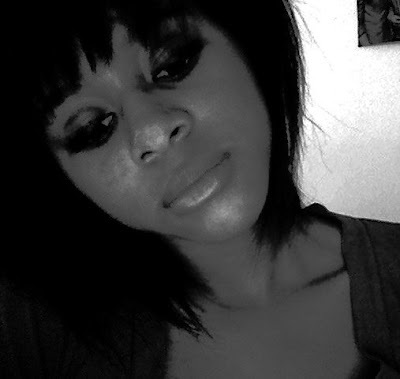 she is also this week's guest host on the popular web series "natural hair tuesdays"